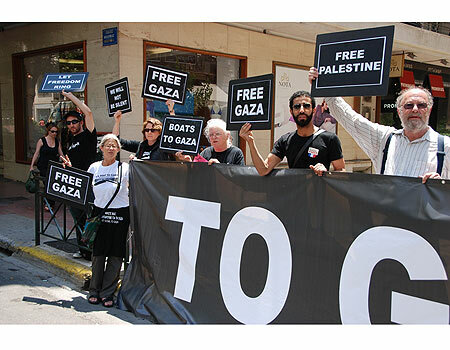 American activists set sail from Greece on Friday aboard a boat set to take part in a pro-Palestinian flotilla to Gaza, defying calls from Israel to cancel it and a ban by Athens. The vessel was stopped by the Greek Coast Guard some 25 minutes after its unauthorized departure. It was not immediately clear whether the boat will be taken back to port. The vessel, dubbed “The Audacity of Hope”, left Perama port for the open seas, a Reuters witness said. Greek authorities said earlier on Friday that ships destined to Gaza were prohibited from leaving Greek ports. Despite the Greek ban, the vessel left port around 4:45 pm Friday, Ynet learned. It was banned from departing by Greek officials citing technical problems, but chose to ignore the orders. In a conversation with Ynet, organizers of the US boat confirmed the details. One of them said that a Greek Coast Guard ship approached the boat and that the two sides were engaged in dialogue. “Israel is doing its very, very best to make sure we don’t get out of port,” Berlin said earlier Friday, adding that the flotilla will be heading to the Gaza Strip next week. In a press conference Thursday, the American activists offered to allow journalists to inspect the boat’s cargo in order to see it has no violent intentions. The vessel is mostly carrying thousands of letters for Gaza’s children, the activists said. The American boat is said to carry some 50 passengers, including crewmembers and journalists. Former Israeli pilot Yonatan Shapira is also on board and is part of the crew.